Have you received a Womb Blessing yet? So what is the Womb Blessing? 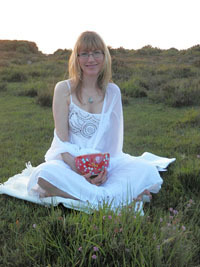 The Womb Blessing is a transformational energy therapy and female practice that brings powerful healing and change to the womb and its cycle, and to the four female archetypal energies, to create connectedness to our femininity, tranquillity and centeredness, female empowerment and well-being. Through connection to the Divine Feminine it opens us to our natural female spirituality. The Womb Blessing is a personal, spiritual and world path for women to awaken to their femininity, to heal their disharmony, and to live a female conscious life. The Womb Blessing can be received through the Worldwide Womb Blessing or once a month from a Personal Womb Blessing given by a trained Moon Mother. A Worldwide Womb Blessing is a free distant transfer of Womb Blessing energy offered five times a year via a meditation practice focused by Miranda Gray. In the Worldwide Womb Blessing women connect together energetically across the world as a group, bringing beautiful healing and awakening to the common patterns shared amongst the group. The Worldwide Womb Blessing also spreads the Womb Blessing energy around the world, with every woman taking part sharing the energy and grounding its vibration into the Earth. A Personal Womb Blessing given by Moon Mothers is a transfer of Blessing energy through a sequence of hand positions and breaths. The Blessing is focused on an individual’s energies, her personal awakening and her connection to her femininity to help her live a more consciously female life. Both the personal Womb Blessing and Worldwide Womb Blessing are equally important in a path of healing the disharmony in our wombs, in our menstrual cycles and in our female nature, of accepting and connecting to our female energies, and of awakening to our authentic female self. Each Womb Blessing, whether a Personal Blessing or a Worldwide Blessing, builds on the transformation and healing of the previous Blessing, taking us deeper into our female nature and awakening more of the aspects and energies of that nature that have been repressed, broken, restricted or made dormant. The Womb Blessing awakens aspects of our female nature – our strength and empowerment, centeredness, intuitive wisdom and inspiration, dynamic energy, empathy and compassion, inspiration, inner stillness, creativity, sexuality and spirituality - that have been repressed or dormant. A Womb Blessing is a sanctuary of Divine Feminine energy away from the pressures and stresses of a masculinised world, where you reconnect with your own femininity in openness, acceptance and love. When the world gets too much. When we feel empty, incomplete and vulnerable. When we don’t know who we are or what it means to be female. The Womb Blessing brings us back to our female nature, opens us to our natural spirituality, and energises the centre of our female empowerment, calling our female soul back to us. “I have seen women recognizing themselves for the first time as female and at the same time recognizing their body and their womb as a place of power, wisdom and information. For some women, they feel their womb has healed repressed emotions and feelings they didn’t even know they had. It has been so beautiful to be present when it happens.” Advanced Moon Mother. ...and the more we hate our body for its disruption, the more it becomes caught in patterns of self-hatred, pain and imbalance. We cannot fight our female nature or have it repressed by our environment without our body reacting negatively. Our womb is a beautiful, powerful centre of amazing and beautiful female energies, gifts, skills and levels of awareness that can create a female life that is full of fun, achievement, love, sharing, acceptance, intuition, magic and deep wisdom and spiritual connection! Our womb is much more than a factory for making babies; it is the centre of female empowerment and the centre of our creative, sexual, spiritual and life energies, and through any disruption it is telling us in a very loud voice that we are thinking and living in a way that is not in harmony with what it means to be female. When the energy centre of our womb is energised and balanced and integrated we feel grounded and centred in our power. We feel complete and whole, sensual and connected to the world and to our spiritual awareness. We easily manage change and we feel secure in our ability to handle any situation without fear of overwhelm. However, when we are cut off from our womb, the womb energy centre becomes depleted and we lose our connection to the empowerment that rests in our lower belly and the stress of the modern world threatens to overwhelm us. The womb is one of the most important influences on a woman’s life. The womb’s cycles (known as our menstrual cycle) and the changing energies and levels of perception associated with each phase of the cycle impact on every aspect of our lives. This includes our feelings about ourselves and our lives, our relationships, our work, our needs and desires, what makes us feel fulfilled, contented and happy. When we ignore this very natural, innate cycle or repress the energies that flow through it, we miss out on one of the most important tool for happiness and fulfilment we have. More importantly, we live a restricted life which chains our female nature within the expectations of society and leaves the source of our power and the home of our female soul a barren wasteland. The Womb Blessing helps us to reconnect to our womb and to heal our womb energy centre and its associated energies. It raises our level of energy and consciousness to awaken the aspects of our femininity with which we have lost contact, and opens our awareness to the energies of our womb and our cyclic nature. The Womb centre is the home of the female soul. Many women who follow spiritual paths and practices still feel disempowered because they do not understand that the womb needs to be embraced as the home of the female soul. The Womb Blessing also deepens our connection to the Divine Feminine and opens us to our natural female spirituality. To experience the Womb Blessing energy for yourself for FREE, join the next Worldwide Womb Blessing and take the first step on your journey home to your authentic female self. The Womb Blessing is so called because a blessing is an activity that takes something that is perceived as ordinary and mundane and returns it back to its original or authentic sacredness. The Womb Blessing takes our female nature and our womb and returns them to their original sacred and authentic state – the original vibration that exists before society and upbringing restrict and limit our female energies and archetypes. Each Womb Blessing deepens our awakening and our realisation about who we are as women and builds on the healing and changes of the previous blessing. The Womb Blessing is a journey back to who we truly are as women. What is the Worldwide Womb Blessing? Started by Miranda Gray in February 2012, the Womb Blessing is now a family of over 65,000 women from 130 countries who regularly take part in receiving ‘The Blessing’ in the five Worldwide Womb Blessings each year. The Blessings are held in February, May, August, October and December. At each worldwide event Miranda and Moon Mothers - women who have trained with Miranda - distantly send the Womb Blessing energy to the thousands of women worldwide who have registered and who are meditating to receive the Blessing. The Womb Blessing family’s youngest member is 9 years old and the eldest is 91 years old. 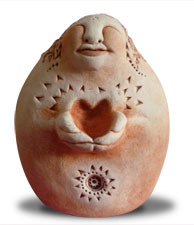 The Womb Blessing is open to all women, whether or not they have a womb or a cycle. Young girls can take part if they have had their first menstruation. Each worldwide event also has an additional meditation which focuses on a different aspect of our femininity. As we receive each Womb Blessing and take part in the additional meditations we awaken more and more to our female nature and release restricted and dormant aspects of ourselves. Join the Worldwide Womb Blessing and experience the awakening for yourself! The Womb Blessing can be received at a distance five times a year through the Worldwide Womb Blessing. Questions about the Womb Blessing? You need to register a ‘Chosen time’ to receive the Blessing from four options. > Register now! You will need two ‘Womb Bowls’ to represent your womb; a candle; some drinking water; a shawl; and a print out or audio version of the ‘Womb Blessing Meditation’. At the time you have registered, you read or listen to the meditation and then sit relaxed to receive the Womb Blessing energy that is being sent to you for 20 minutes. 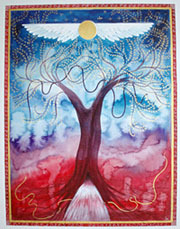 After the Womb Blessing meditation there is a ‘Sharing meditation’ where all women around the world taking part at this time send energy to each other as a group and also anchor the Divine Feminine energies within their country to bring awakening and healing to the land and to all the women in their country. Finally you may take part in the additional meditation if you wish. You can take part anywhere! Women can take part on an airplane, up a mountain, on a beach, in the countryside, in a living room or in an office. Many women also choose to get together and take part in a group, either physically or online. Contact your nearest country representative to find out if there is a group in your area – or start one yourself! After the Womb Blessing the journey begins! However, it is not enough to just be given a gift - we need to unwrap it, take out the present and use it in our lives to fully appreciate it. The same is true of the Womb Blessing. Your first Womb Blessing is like planting a rosebush. Each successive Womb Blessing helps the bush to grow higher towards the light and grow deeper roots into the Earth. In between Blessings we need to nurture the growth so that the bush will be healthy, creating buds, blossoms and fruits in harmony with the natural seasons and cycles. Moon Mothers also offer ‘Womb support healing’ which creates a nurturing and loving environment to balance and energise the female archetypes that are already awakened, as well as helping the newly awakened aspects to integrate into your being and consciousness. The largest physical Worldwide Womb Blessing group meets in Brazil with over 100 women! The event is often a celebration of being female combined with a food, music, dance, sharing and other meditations afterwards. Some groups are mixed with women and men and children joiming in the celebration. Groups held in homes, in public parks, offices, in the countryside, in yoga or dance centres, up a mountain, and on the beach under the Full Moon. Women meet through Skype, transatlantic web conferencing software, and even in a virtual world. Being part of a regular group is to feel connected and part of a worldwide family of women who are passionate about their femininity and their cyclic nature, and who are creative, knowledgeable, enthusiastic, inspired and wise females from all walks of life and life experience. It is a family of women who are awakening and healing themselves and other women in the world, and this creates a sense of a supportive sisterhood who validate and support you in your own journey and healing. “Most women feel very positive after the Worldwide Womb Blessing as for many it has been the first time they´ve been in a group of women. Most mention feeling grateful for the opportunity to heal emotionally and spiritually and for the space we create where they are allowed to express themselves freely in an open space.” Moon Mother, Mexico. Groups can be run by any woman.. The Personal and Worldwide Womb Blessings work in different ways and both are an important part of the path towards healing and awakening our femininity. The Worldwide Womb Blessing is like being in an orchestra, whereas a Personal Womb Blessing is like giving a solo in the spotlight. In an orchestra you become part of something much bigger than yourself that raises you beyond what you could express on your own. In the Worldwide Womb Blessing women connect together in the same harmonic of transformation which brings beautiful healing and awakening to the patterns shared amongst the group. Each woman taking part in the Worldwide Womb Blessing gives as well as receives the energy and the more women who take part in each Blessing the more energy, healing and awakening available to all women around the world. To take part in the Worldwide Womb Blessing is to heal yourself, heal other women and heal the world. A personal Womb Blessing is like a solo performance where you stand in the spotlight and develop and express your full range and potential of being. The Blessing focuses on your femininity, healing your individual patterns, and awakening the aspects of yourself that most need to be expressed in your life. It is also like a quiet female oasis in a world barren of female energies. It is a time to breathe deeply, to let go of stress and to relax into the real you and remember the wonderful gifts and joyful beauty of being a woman.